The only upright dissectum maple is Acer palmatum dissectum ’Seiryu’ , and it has always been a favourite of ours. We were first attracted to the fine lacy foliage. A very attractive mid green. Then we fell in live with the brilliant autumn colour. This is a maple that holds interest until its foliage disappears in autumn. 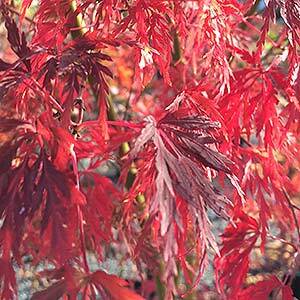 Acer palmatum dissectum ’Seiryu’ is grown for the attractive foliage as a feature tree. It is also a useful small shade tree. Its upright habit makes it suited to smaller gardens and courtyards. Also suited to planting in front of walls where it provides a strong visual contrast. It is a suited to growing in containers. This is a very easy care Japanese Maple, it is best grown in a protected position as this improve foliage colour and prevents burning in the heat of summer. A humus rich well drained soil will suit Acer palmatum dissectum ’Seiryu’. Yearly applications of a general purpose flow release fertiliser will improve growth and overall pant health. Watering will be required through the first few summers. Once established Acer palmatum dissectum ’Seiryu’ is fairly drought tolerant if the soil is well mulched and the tree is protected from hot drying winds and sun. Height – 3 to 5 metres over time depending on soil and climate. Spread – 3 to 5 metres over time. Position – Full sun, however best when protected form the hot afternoon sun and hot drying winds. Growth Rate – Slow to medium depending on soil and climate. Foliage – Green lacy and finely dissected turning to a brilliant red in autumn. Flowers – Insignificant red in spring. Bark – New bark is green ageing to a grey over time. Drought Tolerant – No, but very hardy and does not require a lot of water in good soil when mulched.